Good morning from TCF Bank Stadium, where the Gophers take on Big Ten West champion Northwestern (11 a.m., BTN), aiming to secure bowl eligibility with a victory. The Gophers (5-5, 2-5 Big Ten) will try to build a conference winning streak for the first time under coach P.J. Fleck, while Northwestern (6-4, 6-1) seeks its eighth consecutive Big Ten road win. The Wildcats clinched the West title last week with a win at Iowa and losses by Wisconsin and Purdue (41-10 to the Gophers). With its spot in the Big Ten Championship Game secured, Northwestern is playing for bowl positioning. The betting public seems to believe that the Gophers will be more motivated in this game. The opening line favored Northwestern by 4 points, but it now has Minnesota favored by 2. Today’s game marks Senior Day for the Gophers, and they’ll honor Blake Cashman, Emmit Carpenter, Jerry Gibson, Donnell Greene, Jacob and Julian Huff, Payton Jordahl, Gary Moore, Antonio Shenault, Rodney Smith and Jared Weyler. Smith, who was lost for the season to a knee injury in the second game, will walk with his classmates but plans to return next year for a final season of eligibility. The Gophers will seek that from the NCAA after the season. For today’s newspaper, I wrote a feature on Carpenter , who’s made a big impact in the community with his charity work and hospital visits. He’s enjoying a solid senior season and the memories he’s made. “Oh my gosh, I can’t even describe how fast it went. I remember being a redshirt freshman four years ago, and Pete Mortell was the starting punter and Ryan Santoso was the starting kicker,’’ Carpenter said. “I was a young kid, and I could help but think, ‘Man, I’m going to be here forever. These five years are going to feel like such a long time. I have so much time left to do all these things I want to accomplish.’ Next thing I know, I’m a 23-year-old man on the team and getting out there and playing for three or four seasons. It’s been so much fun. I’ve created so many memories and so many friendships with people on the team and in our program in general that I know will be a part of my life as long as I can think of. 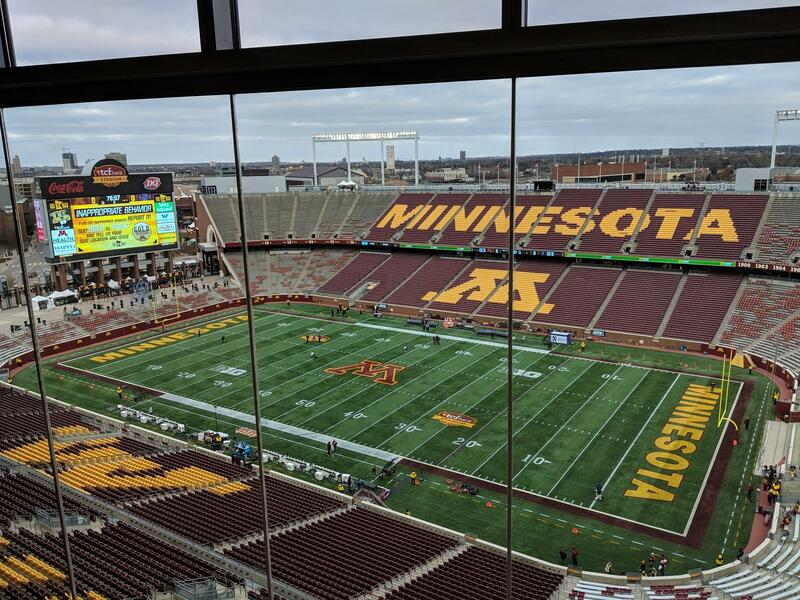 It’ll be a chilly day -- the temperature at 9:15 a.m. was 22 – and Fleck and the Gophers have stressed how they embrace Minnesota’s November weather. Northwestern got in the act, too, with a large group of players going shirtless for early warmups. The Gophers will try to build off their strong defensive effort against Purdue, when they limited the Boilermakers to a season-low 233 yards and held them out of the end zone until 5:28 remained in the fourth quarter. Minnesota was especially stingy on third down, holding Purdue to 0-for-12 in those situations. Minnesota’s offense has been solid lately, averaging 36.7 points and 445 yards over the past three games. Offensive coordinator Kirk Ciarrocca sees a unit that starts seven freshmen hitting its stride.